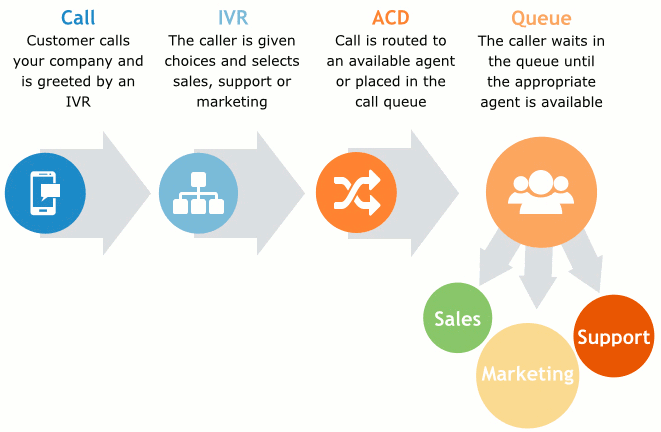 Automated Call Distribution (ACD) is the centerpiece of an inbound call center logic. When a customer make a call to your call center it must real right agent in shortest possible time. Our flexible ACD module gives us many options eg Calls can be routed under following criteria / conditions. As the name goes, Time of day routing does call routing as per different times of the day. If your office closes 5:00 PM the call can be routed to voicemail, or routed to agent at home. Likewise if you have two offices of different time zones one in USA and other in Pakistan. Maybe you wish USA office-close timing calls to be landed in Pakistan office. With intelligent skill-based routing, calls can be routed to targeted agent. For example for Pashtu language selection different agent, likewise Urdu and English languages. Beside language skills you can weight your agent as per their individual skill level or experience, seniority etc. By doing so we can define that more calls should be routed to more skill level agent. Many office have different departments say Press 1 for sales, 2 for complains 3 for booking etc such calls will be routed to right agent this system will benefit your organization in many ways listed below. Location routing is useful when you have offices in multiple cities or countries. People dial your call center number with their respective city area code but the call is landed in your central office / call center. In other situation, if one office is closed call is routed to open office which is geographically located at different place. Calls can be routed if number is already stored in CRM or Databse. There are many other attributes that can be assigned to incoming calls and that very call can be routed as desired. For example if a person calling from certain sector or area of city and his/her number exist with sector / area information then call can be routed to agent who is assigned to that very area of city. Likewise if a financial institution keeps updated record of credit card defaulter then their call can be treated altogether differently even starting from specific menu designed for such defaulters. Possibilities are endless.